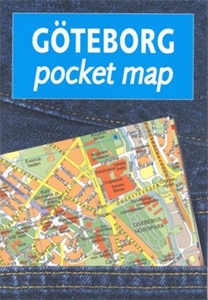 Gothenburg/Göteborg in a handy size, indexed pocket atlas from Liber Kartor with diagrams of the public transport networks, a road map of the city’s environs, and ferry connections between the nearby islands. 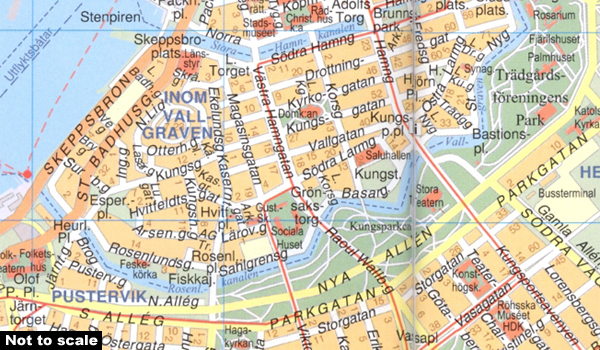 The plan shows the city with its network of tram routes (line numbers are not given) and ferry connections. 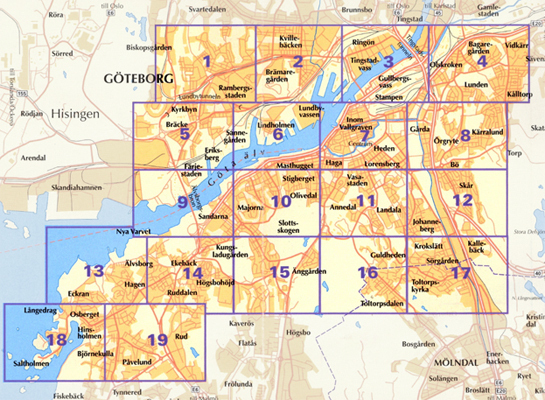 Main public buildings are highlighted and named, and streets are shown with selected house numbers for easier identification of addresses. There is no map legend but all information is self-explanatory. Street index includes a list of useful phone numbers. Also provided are diagrams of tram lines plus regional bus and train networks, a road map of the city’s environs at 1:488,000 and a map of ferry routes connecting the nearby islands.